Tagged under Square Enix, Light Novel, Games. "The closer you get to the light, the larger your shadow becomes." When stars begin to disappear and 14-year-old Sora's home, Destiny Islands, is engulfed in a freak storm, he must journey across worlds to find his friends, Riku and Kairi. 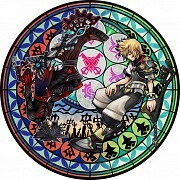 As master of the mysterious Keyblade, Sora must battle the soul-eating Heartless and discover where true strength lies. 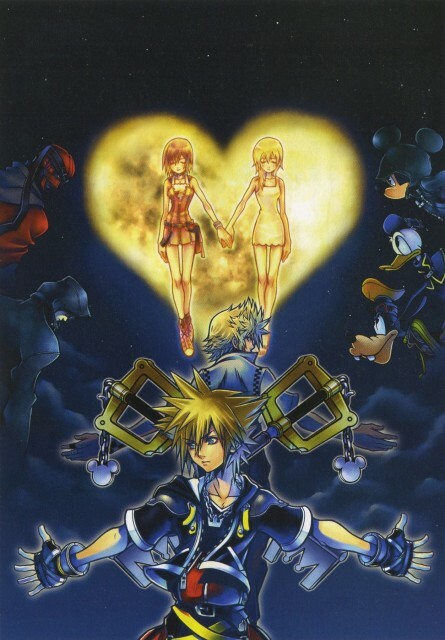 Kingdom Hearts is the first collaboration between powerhouses of animation and gaming, Disney and Square Enix. A fun, light-entertainment role-playing game featuring cameos by a plethora of familiar characters, from Cloud Strife and Sephiroth to Hades, Tinkerbell, Jack Skellington, and Maleficent. Note: For all Disney characters appearing in Kingdom Hearts, see Disney Characters. Kingdom Hearts isn't a failure. I can't say it's a home runner either. It's simply an idea gone wrong and certain turns. Or it's just an idea that made sense on paper, but producer's eyes were covered with a blindfold. SE didn't see anything beyond a catchy tune, a plot that sounds nice, and Disney characters. It's about 48 hours of gameplay(If you skip through all the worlds pretty quickly), but if you are a perfectionist, then it would probably take about a week to get everything. And you know what? AFTER YOU GET EVERYTHING, THE GAME IS POINTLESS TO PLAY.